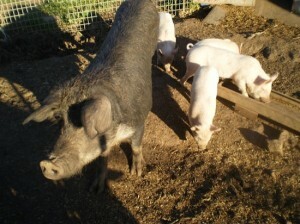 There was a little bit of discussion about feeding scraps to pigs on my original entry about our pig project. There are quite strict laws around the feeding of scraps and waste to pigs in Australia (and many other countries), and you really need to make sure you’re doing the right thing. The NSW Department of Primary Industries (DPI) has a good fact sheet on swill feeding. I’ve summarised some of the info below for interest, but don’t rely on my wording – read the original for yourself if you’re planning to keep pigs! “Swill feeding” is the traditional name for the feeding of scraps and other waste material to pigs. What can’t you feed to pigs? Note that these laws apply to all pigs, regardless of whether you’re going to eat them, breed from them, or just keep them as pets. So what can you feed to pigs? If you’re going to feed allowable waste to your pigs or other livestock, you still should make sure you know where it’s from and ensure it’s not contaminated with herbicides, pesticides, chemicals or other substances. Again, the NSW DPI has a very good factsheet on the dangers of feeding waste material to livestock. What’s wrong with feeding pigs swill? In a nutshell, it’s a potential vector for the spread of disease. Meat and meat products can be processed and fit for human consumption, but still contain certain animal viruses. Humans are not affected by them, so there’s no food quality or health issue, but animals eating these products could pick up the disease. With food being imported from all over the world, there’s a veritable smorgasboard of diseases that could be introduced. Some of the serious possibilities include: foot-and-mouth disease, swine vesicular disease, African swine fever, classical swine fever, and trichinellosis. Thanks to our physical isolation from the rest of the world Australia is relatively disease-free, and it’s important to our primary industries that we maintain that. This applies to feral pigs too! Something I hadn’t thought about before, but very important, is that food waste must be kept away from feral pigs as well. If you live in an area that has feral pigs about, you should make sure they can’t get at your rubbish bins. If you bury or tip rubbish on your property, make sure it’s securely fenced to keep pigs out. It only takes one feral pig to pick up a disease from a discarded salami wrapper and we could have a major outbreak (foot-and-mouth virus can be carried over 10 km just on the wind!). But didn’t people used to feed all their scraps to pigs? Yes, that was a traditional practice and it’s still done in some countries. I believe that it wouldn’t be such a problem in a more localised economy. If all your food was coming from your local area, then your meat scraps wouldn’t be a potential vector to bring in new diseases from afar. Any disease they contained would already be present locally! With the current global economy, food can be imported from anywhere in the world. The diseases and pathogens that can can come along with it are unlimited. That’s why we now need to be a lot more careful in how we raise and feed our animals. Plus you could be fined up to $11,000 for breaking the rules!